As the weather cools and the winds become chilly, "It is always wise to have a wrap with you for the evening." A direct quote from Jeanette Ward, our Grandmother. We have always remembered this and frankly, it's true. Scarving Artists features one of a kind nuno felted scarves and pop-toppers. These silky scarves are beautiful, unique, and hand felted scarves to bring out the brilliant colors and designs. 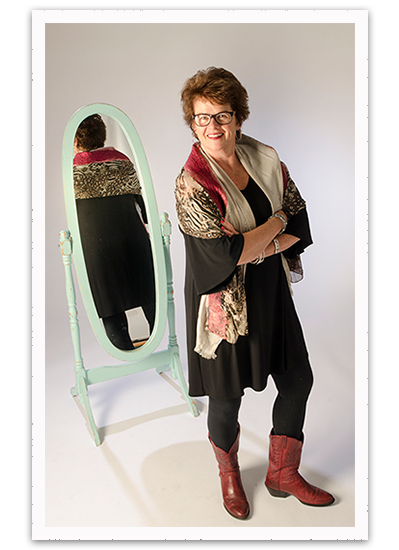 Mary Beth Stevens started making scarves several years ago, spurred on by her two scarving sisters, Susan and Tricia. Older sister Tricia, an avid knitter, discovered the wonders of nuno felting as a way to make unique and beautiful scarves. She shared this unique scarf-making process with her sisters, and it has now become a family affair. 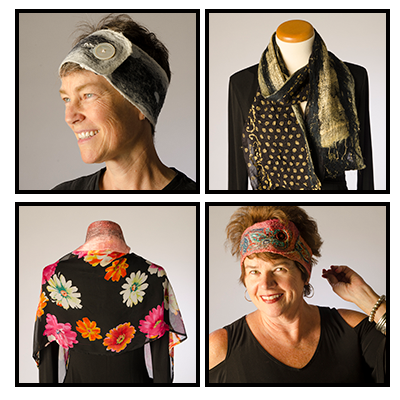 Mary Beth formed Scarving Artists, and together are making beautiful, one-of-a kind scarves – or should I say fashion statements! Located in St. Paul, Minnesota, each scarf is lovingly designed and made using up-cycled materials along with Mary Beth's creative flair. Unique, beautiful, stunning – just a few adjectives used to describe these works of art. No two scarves are alike. We enjoy getting out to meet people and making new friends along the way. Blending artistry and practicality has allowed us to create “wearable art” that will get you noticed. We invite you to visit our gallery or contact us to find out how you can own a one of a kind scarf. If you would like to visit us at one of our trunk shows please visit our events page to learn more.